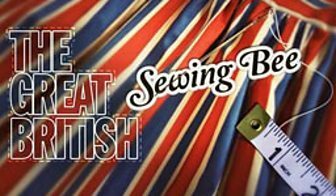 Have you been watching the Great British Sewing Bee? What do you think of it? I love that there is sewing on the television and revel in the intricacies of getting the under stitching perfect or managing to put in an invisible zip err…invisibly. I only wish there were more of this sort of geeky detail, I mean we haven’t seen the inside of any of these clothes yet! Who do you want to win? I’d like it to be Chinelo; I love the way she just draws on the fabric with a bit of chalk and then seems to cut out the most amazing designs. The big question for me though is, why would any one want to watch it if they didn’t sew? I’ve never watched the Great British Bake Off but I can imagine that even if you don’t bake you can at least drool over the cakes. 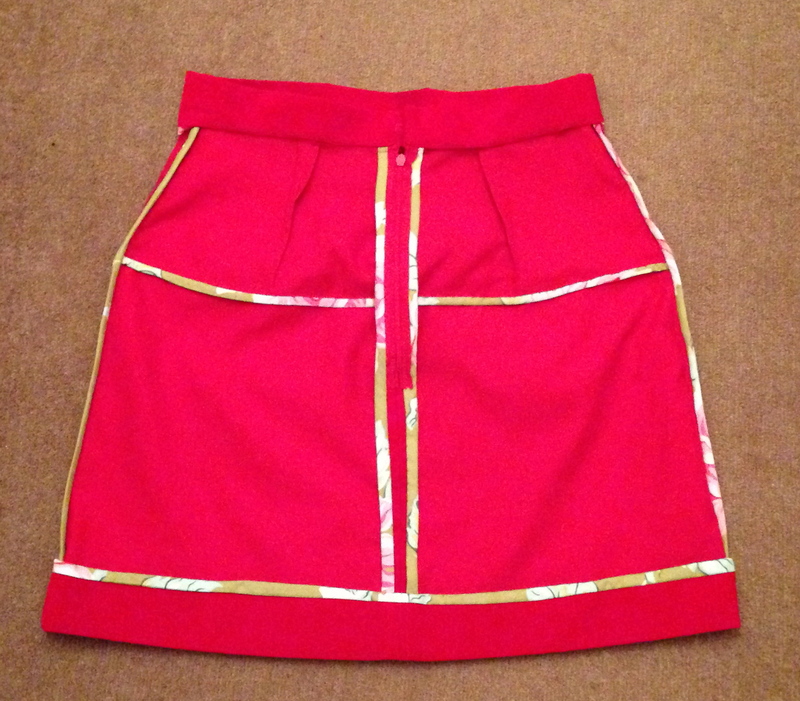 The clothes made on the GBSB aren’t really that exciting, in fact most of them are really a bit boring. If I wasn’t a sewer already I don’t think I would start as a result of watching this programme. I am sure that most sewing bloggers will have heard of By Hand London who designed the Charlotte skirt amongst other lovely patterns. Their latest venture is to start printing fabric on demand. The idea is that you can design your own fabric, send it to them and they will print it out, initially on cotton poplin but if they idea takes off then silks and jerseys and other fabrics may be possible. As the fabric is printed on a digital printer you can have as little or as much printed as you want. This blog post explains the concept. At present By Hand London need funding to get this started so they have set up a kick-starter page to attract backers. This is such a great idea, I just now need to start thinking about what my design might look like! Does the world need another V1247? Anyway enough of the excuses and back to V1247. This one is made out of cherry red corduroy from Truro Fabrics, it’s quite a lightweight corduroy and the colour is to die for. I finished the seams as it tells you to do in the pattern using some bias binding made from a piece of fabric sitting in my “spare ⅔ m” box. It was whilst I was doing this that I realised that I really needed a bias binding foot. 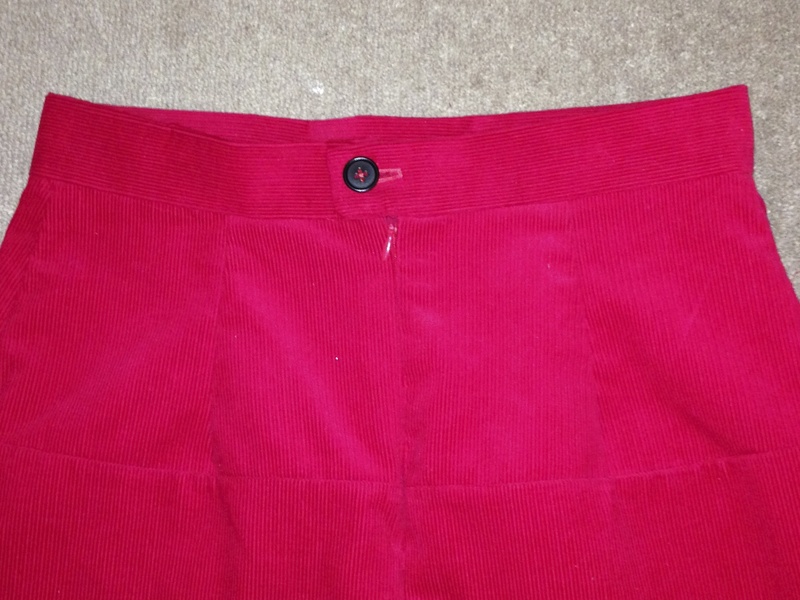 The waistband is finished with a button because I prefer buttons to hooks and eyes.